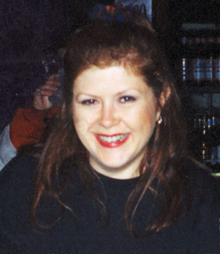 MacColl in Chicago, March 1995. Kirsty Anna MacColl (10 October 1959 – 18 December 2000) was a British singer and songwriter. She sang the songs "They Don't Know" (1979) and "There's a Guy Works Down the Chip Shop Swears He's Elvis" (1981). She also did cover versions of "A New England" by Billy Bragg and "Days" by The Kinks. She was well known for singing on the Christmas song "Fairytale of New York" by The Pogues. She performed on many songs produced by her husband Steve Lillywhite. MacColl was born in Croydon, Surrey, England. She was the daughter of folk singer Ewan MacColl (1915–1989) and dancer Jean Newlove (1923–2017). She was married to Lillywhite from 1984 to 1994. They had two sons, Jamie and Louis. MacColl died in an accident on 18 December 2000 in Cozumel, Quintana Roo, Mexico. She was 41. She had been diving in a reef with her sons when a motorboat entered the restriced area. She was able to pull her son Jamie to safety but was hit by the propeller in doing so. She died instantly. ↑ "Venues - Kirsty MacColl". kirstymaccoll.com. Retrieved 30 November 2017. ↑ Laville, Sandra (20 December 2000). "Kirsty MacColl killed in boating accident". The Daily Telegraph. Retrieved 30 November 2017. ↑ Pareles, Jon (20 December 2000). "Kirsty MacColl, 41, Pop Singer and Songwriter". The New York Times. Retrieved 30 November 2017. This page was last changed on 2 April 2018, at 01:18.